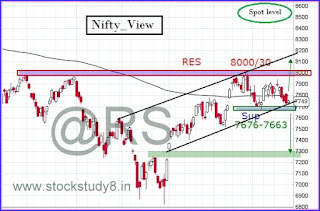 Today In this Post will Try to Forecast about Nifty Next Move. 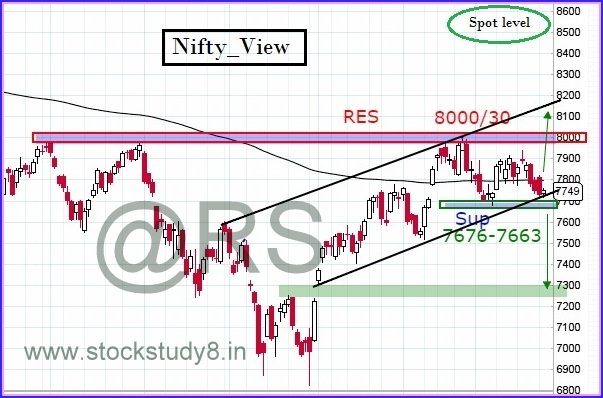 Last time I wrote in March when Nifty was at 7450. For Target 7979. that successfully done and fail to give close above it. and Todays Chart looks like this.. check below chart. From last 2 month we are in range of 7979-7676.
and this point in market lots of noise for 7200/6800/6400 and upside 8500/9200/10k. but truth is currently we are in sideways Market 7676-7979.
and Its hard to predict where market will go before Breakout or Breakdown for me as well for all analyst. there mindset may say we will fall because 1200 point rally done etc etc. 1. Currently We are in sideways Market 7676-7979.
i)Close Above 8030 Will Lead 8650/8950/9133++ &10k (Not in a Straight way, zig zag) Buy on dips SLCB 7676.
i)Close Above 7820 SL 7720 Target 8000/8181+ and then correction. ii)Close Below 7676 Sell on rise 7788/7820 SL 7940 TGT 7525. Hope you Like this View. Share it Bindass.